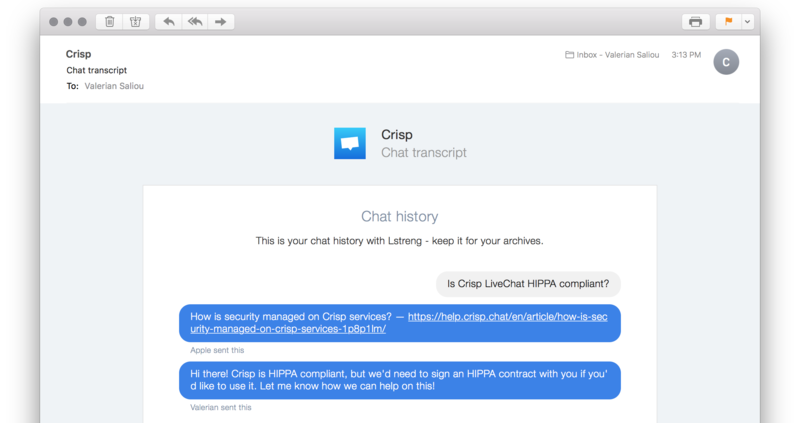 Crisp automatically sends chat transcripts to visitors and operators once a conversation ends. You can still adjust how those transcripts work. Transcripts are emails sent to you and your users, that contain a record of a previous conversation. They are useful to keep copies of chats over time in a safe place (ie. an email mailbox). When do transcripts get sent? Transcripts get automatically sent to a visitor and all agents, 1 hour after the last message was sent in the conversation. The conversation is considered either closed or stalled, and thus an automatic transcript is sent. How to disable visitor transcripts? Click on "Chatbox & Emails settings"
Disable: "Email users transcripts of conversations"
How to disable agent transcripts? Disable: "Email me transcripts of conversations"
This only applies to your own Crisp account. Other agents in your team will still receive agent transcripts, accordingly to their notification settings. How to manually send transcripts?